The difference between most chocolate chips and and the chips Jacques Torress uses is like the difference between coffee and cocaine. The chips are stronger, more addictive and not easily found in supermarkets. Jacques uses his own over-sized in-house dark chocolate discs rather than the puny chips most gourmet cookies contain. When you order a cookie from his Dumbo, Upper West Side or Soho stores you can choose from crispy and well done to chewy and more raw. Even the least well-done cookie is cooked more than a Levain and is much smoother in texture. They even have a giant steel hot plate to keep cookies warm all day. There are also no granular sugar crystals or shiny pockets of wet butter, hallmarks of the Levain cookie. While fans of Levain will say Jacques cookies have too much chocolate my vote goes for the French guy because I love the copious amounts of dark chocolate he uses and I like my cookies baked until dark brown. 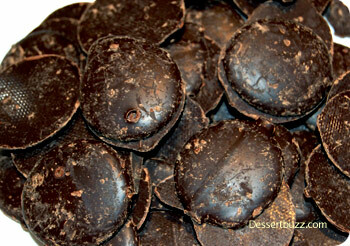 Visit the Jacques Torres website here. He now has stores in DUMBO, SOHO, Chelsea Market and on the Upper West Side. He also has an outpost in Harrah’s in Las vegas. 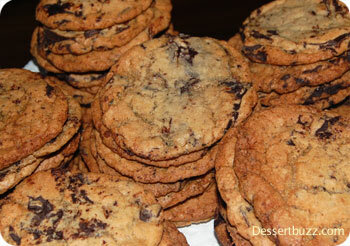 Recommended: Chocolate chip cookies (you can request you preferred crispiness), hot chocolate, both frozen and hot. I found and saved your recipe for chocolate chip cookies which recommends using Jacques Torres chocolate chip/discs. How or where can I order them.